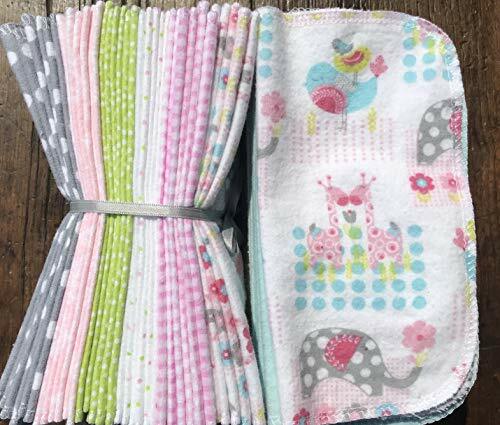 These 8 inch square cloth wipes are made of one layer of super soft 100% cotton flannel. Whether you use these to clean baby's hands, face, or bum, you'll love knowing that they are gentle on your little one's skin. As an added bonus, using reusable wipes means lowering your carbon footprint! Set of 36 wipes. This is a perfect starter kit for cloth diapering. Your set of 36 will closely resemble the photos, but may have a few different patterns added in. These are a great addition to any cloth diapering household. Folded in half, they fit perfectly in a used wipe container or warmer. I keep mine in a wipe warmer with a little water, and then throw them into the dirty diaper bucket along with soiled cloth diapers. They wash up so nicely and dry in a flash! I like to keep a separate stash in the kitchen for cleaning little faces after meal time. They make great napkins for little diners, too! The edges of these wipes are machine serged for durability, and the corners are rounded. Wipes are pre-washed and shrunk. Machine wash (hot or cold, doesn't matter!) and dry. From our happy customers: "These are beautiful! Very well made. You can tell they were made with care. Almost too pretty to wipe our future baby's bum with! Nice and soft, too. Thank you!" "Very easy transaction. Beautiful, very soft wipes. Great quality. Will definitely purchase from this seller again!!!" "These arrived so quickly and were exactly what I was looking for. Cute fabric and washed well-thanks so much!" If you have any questions about this product by As You Stitch, contact us by completing and submitting the form below. If you are looking for a specif part number, please include it with your message.